Premiership newcomers Wolves have completed the £1.75m signing of Sunderland defender Jody Craddock. The 28-year-old travelled to the Midlands on Wednesday to discuss personal terms and undergo a medical. Craddock will join Nigerian defender Isaac Okoronkwo at the heart of Wolves' new-look defence as manager Dave Jones continues to build a squad fit for the top flight. The Wolves boss has already secured the services of Oleg Luznhy from Arsenal and has added Portuguese international Silas to his midfield. "He is a good defender who knows the premiership inside out," said Jones of Craddock. "He is an excellent addition to the first-team squad." Wolves also remain cautiously optimistic of getting Italian Dino Baggio on loan from Lazio following talks on Monday. Black Cats chairman Bob Murray admitted that he was sad to see Redditch-born Craddock leave the Stadium of Light after proving himself one of the club's most reliable defenders. "I have spoken to Jody personally as this was a very tough decision to make," he said. "He is an impeccable professional who has always done his best for the club. "Jody has been with us for six years and has given his all during that time, but is moving closer to his home town, which will give him and his family a fresh start. "Everyone at the club is very sorry to see Jody go but wishes him and his wife every happiness and success in the future." 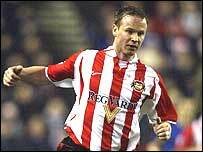 Craddock joined Sunderland in a £350,000 move from Cambridge in July 1997 and made 168 appearances for the club. Quick across the ground and a good reader of the game, he has been the Black Cats' most consistent defender in recent seasons. And his departure will leave manager Mick McCarthy looking for a replacement with Republic of Ireland international Gary Breen thought to be on his list. "We can do more than just survive in the Premiership"